The Yankees have “looked into” Matt Garza, but a Cubs official downplayed the likelihood of any deal involving the right-hander, according to Sherman. Cub fans should love the Cubs to trade Matt Garza while his stock is high. He had a good campaign in 2011. 1.) Matt Garza or Zach Rosscup contribute positively to a Cubs World Series championship team. 2.) Garza or Rosscup are traded for more than Chris Archer, Robinson Chirinos, Hak-Ju Lee, Brandon Guyer, and Sam Fuld. 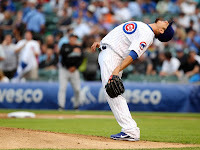 Garza pitched very well for the Cubs last season, raising his status to a potential co-ace or #2 starter for a good team. Perhaps Cashman and Co. look at Garza as a worthy #2 starter to CC Sabathia. If so, the Cubs should begin discussions with yet to turn 19-years old Gary Sanchez. The Yankees particularly like Gio Gonzalez and the Athletics are open to anything, but GM Billy Beane is asking for an ace return for Gonzalez or Trevor Cahill. The Yankees like John Danks and the White Sox like many Yankees prospects, particularly Austin Romine. However, Danks is a free agent after 2012 and the Yankees are reluctant to over-spend on a pitcher they’ll have for just one year. If the Yankees don't make a major acquisition before Spring Training, they could pencil C.C. Sabathia, Ivan Nova, A.J. Burnett and Phil Hughes into four rotation spots. Free agent Freddy Garcia could return on a one-year deal and prospects Manny Banuelos and Dellin Betances may contribute at some point in 2012. Billy Beane should ask for an ace return in his two young pitchers. Gio and Cahill may not exactly be aces, yet, but they are young enough to project towards having an "Ace" season within the next 2 or 3 years. Don't let anyone tell you otherwise. The Yankees can't get John Danks, Gio Gonzalez, or Trevor Cahill without giving up Ivan Nova or any of their 5-star prospects. Who else do the Yankees have to offer? Their return must be more blue chip than Matt Garza or John Danks to move Banuelos, Betances, Ivan Nova, or Jesus Montero. tbd - Combination of Banuelos, Betances, and Hector Noesi, re-signing free agents Freddy Garcia and/or Bartolo Colon, signing other teams' free agents, or finding a trading partner. Capuano, Wilson, Hughes, Nova, and Noesi all spent considerable time throwing out of the bullpen at some point since in the past three seasons, which skews the data for their contributions. Interesting, how someone like Chris Capuano looks lousy in ERA+ and very good in SIERA. Hmmm? Let's hear from the Yankee fans... What should Brian Cashman do with the tail end of the rotation? How many arms should they add before Spring Training? And, who do you like the most? Hit us up in the comment section (below) or on Twitter.